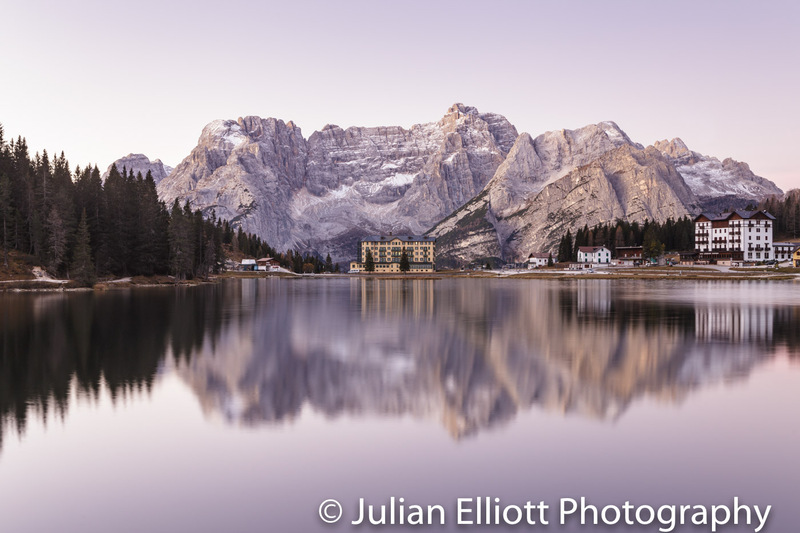 A seven day photography tour of the incredible landscape of the Dolomites. 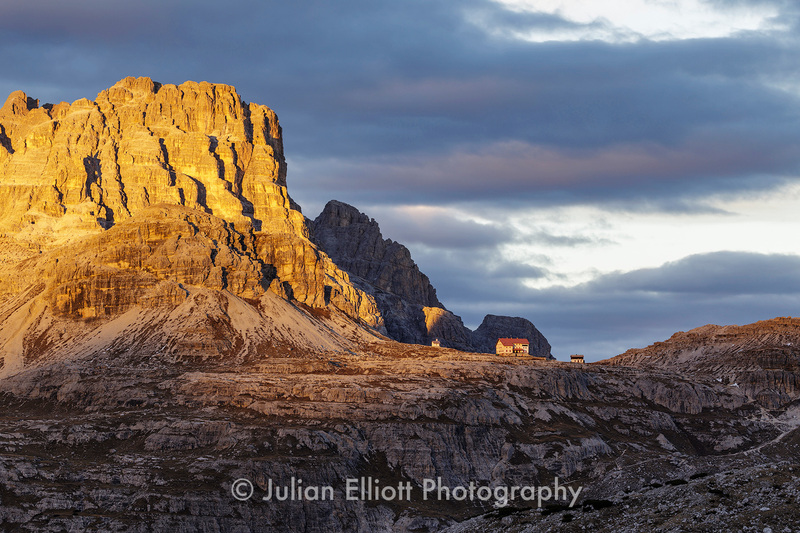 Join me for a fabulous tour of the Dolomites in October 2019. The tour will be based in two separate areas so that we can maximize our shooting potential of this beautiful area of northern Italy. 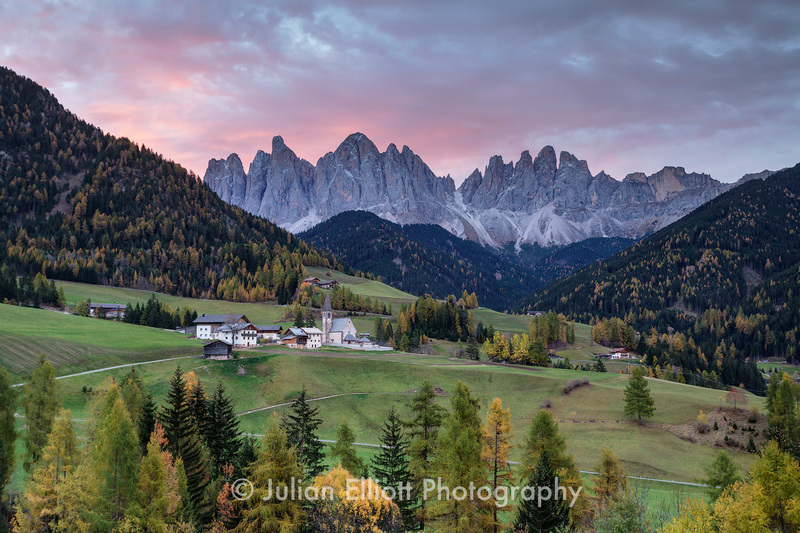 The very thought of the Dolomites creates images of high jagged mountains, misty mornings and vineyards and forests full of autumn colour. During the month of October, we start to see the first colours of autumn as well as those beautiful misty mornings. We will endeavour to make the very best of the morning and evening light. You will be taken to some of the very best locations and also lead you to explore lesser known spots, so you can capture a wide array of classic landscape imagery, from breath taking landscapes and vineyards to lifestyle and close-up photography. There is the possibility that we will use one or two of the cable cars to get us up high to enjoy some mountain vistas. These average around 20€ or 30€ for a return trip and are not included in the fee. However, I can assure you that the views are incredible and well worth the extra expense. Our stay is based in three or four star hotel accommodation. The hotels provide us with breakfast in the morning. And in Ortisei our accommodation also includes dinner too! Venice Marco Polo is served by a multitude of international flight operators from budget airlines to the more commercial airlines such as British Airways and Air France. Recommended flights will be posted soon but please do get in touch. We will all meet at the arrivals lounge at Venice Marco Polo on 19th October 2019. Please ensure that you arrive in good time and eaten lunch as we will be headed straight off to our first hotel. How about getting back to the airport? After breakfast and a dawn shoot on the Saturday we will be headed back to Venice Marco Polo airport. Walking shoes are perfect for the countryside. Do be aware that during those misty mornings that the grass will be full of dew and it would be wise to have boots that are waterproof to keep your feet dry. As we will visit towns and villages, a pair of trainers / sneakers will help keep you feet cool and will make the walking easier. A wide angle lens (16-35), medium zoom (24-70) and a longer zoom (70-300) will be ideal to cover most compositional eventualities but don’t forget the macro lens if you have one. The most used will be in the 24-70 range as a super wide angle doesn’t always translate, so make sure this focal length is covered. It’s best not to weigh yourself down, so why not bring an airport style bag for all your kit and a smaller day bag, which you can decant equipment into throughout the day. Although not essential, its a great idea to bring a laptop computer with you so you can discuss imagery with myself and others in the group. It really is a great learning experience, so it’s highly recommend bringing a laptop to learn and for personal entertainment. I try to make a point of tutoring digital photography to all my clients, to help complete the learning process. It really helps to have a computer session when tiredness takes hold, or inclement weather persists. It's easy! Just use the Paypal buttons below to checkout. The balance will be due 4 weeks before the start of the tour/ workshop. You can always decide to pay the full amount up front too if you wish.